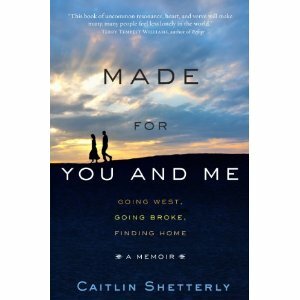 In her newly minted book, Made For You And Me, my friend and Portland neighbor Caitlin Shetterly chronicles her small family’s inspiring cross-country odyssey in search of the American Dream. I won’t blow the arc of this very compelling story, but it has a lot to do with the Great Recession and our prevailing economic free-fall. Made For You And Me sits among the iconic westward-ho greats by Steinbeck, Woody Guthrie and Wisconsin’s own Laura Ingalls Wilder. Yes, I am talking about Little House on the Prairie – one of Caitlin’s favorites, too. NOTE: I expect she’s pretty busy these days but I have asked her for one of her recipes, so stay tuned! This entry was posted in Travel and tagged American Dream, California, coast-to-coast, community, cross-country, Dan Davis, dinner parties, economic crisis, family, Great Recession, hard times, home cook, journey, Kerouac, memoir, mobile, new generation, NPR, odyssey, out of work, perseverance, Portland Maine, road trip, rural maine, Shetterly, unemployed, Weekend Edition, west, wild west, Winter Harbor Theatre Company. Bookmark the permalink. You said it, Libby, she is busy! Thank her for the recipe it sounds delicious and I expect you to make it for us when you come here!